Having a diet from Monday to Friday has developed a sense of discipline and determination in me to stick to my routine. By the time the weekend comes, I'm just relieved that I can finally have my cheat days and indulge! I've been going to Breakfast Bin for years now. It's right along Maginhawa, a famous foodie street in Quezon City which is accessible to students and residents who want good grub without the intimidating price points. Their narrow space can only sit three groups of four at a time, with an al fresco area which could accommodate two more groups, but I'm not complaining. 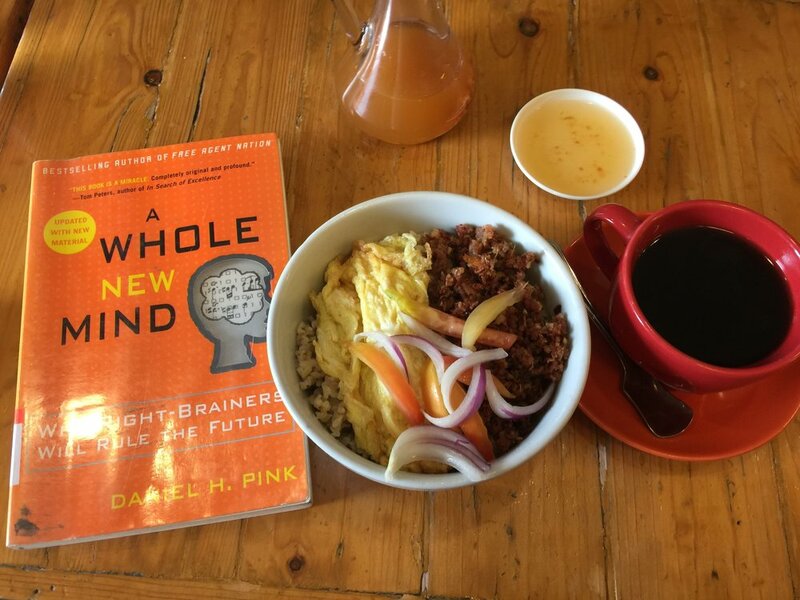 They have since opened a sister resto called Oinkster and is also open for breakfast, but I still prefer their original setup because it reminds me of being a student myself (I graduated high school in Holy Family School, which is along Maginhawa) and of simpler times. My go-to order here is this glorious BB Toasted Naked Longganisa with brown rice and coffee. Their pinakurat vinegar perfectly brings out the saltiness of the longganisa, which is a local breakfast sausage. The brown rice makes me feel less guilty especially since I eat this after working out (haha I know, less guilty!). And their coffee is similar to Cafe Mary Grace's homey brew. All in all, it is a familiar staple which I cannot complain about. You have to try it because it's damn good. I'm currently reading A Whole New Mind by Daniel H. Pink. I was fascinated by his other book Drive that I just had to read his earlier work too. I like his writing style as he can give you ideas which are well-researched without sounding scholarly or intimidating. It basically speaks about adapting your way of thinking to respond to changes in our world today, such as globalization and outsourcing. It feels great to be back with food blogging. The last time I did this was during the glory days of Multiply. Now that I have my own website, I feel inspired to write about my favorite food and hopefully you can try them too one of these days!